Melinda WilliamsAfter training and working as an Early Childhood teacher in both preschools and schools Melinda ventured into the world of personal growth and kinesiology. Melinda is a Registered Specialised Kinesiology Practitioner (RSKP) with the Australian kinesiology Association and is a member of ATMS. Melinda has trained in Primitive reflexes with Bernard Carson and Shanagh Sangster and has a Diploma in Allergies and Environmental Therapy. Through exploring her own sensitivities and those of her family and students Melinda has also extensively researched Sensory Processing Dysfunction and a variety of healing modalities and concepts in mind, body and spirit and incorporates this knowledge into her approach. 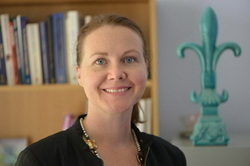 A facilitator of personal growth with a real interest in emerging concept of heart brain integration and coherence, epigenetic factors in well being and health down to a cellular level Melinda is passionate about learning and researching new approaches to wellness. Additionally Melinda facilitates people to access a deeper connection to their core self and supports people to be actively involved in their quest for wellbeing and growth. As an advocate of self awareness Melinda is committed to her own personal development and is passionate about inspiring others to dare to create their most fulfilling life. To complement her heart based approach Melinda is launching Cyberscan into her practice. This is a TGA approved Biofeedback medical device with proven therapeutic benefits. It incorporates quantum technologies to identify how people regulate to different stresses and then supports them in this. This is an exciting step into the future of total wellbeing. Melinda uses Neural Organisation Technique, Training in primitive reflexes, Neuro-spiritual Integration, EFT, Reiki, The Liquid Crystals and other essences in a kinesiology balance with a nurturing and compassionate approach, supporting children, mothers and the whole family towards creating and sustaining uplifting change.